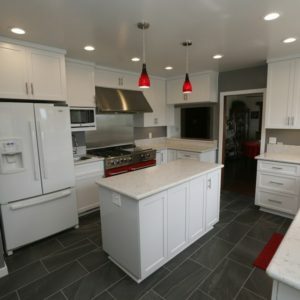 Depending on the scope of your project,Kitchen remodeling in Cerritos CA has the potential to involve many challenging tasks, from installing perfectly level countertops and cabinets to rerouting plumbing and gas lines. Naturally, you need an experienced contractor like Cabinet Magic to make your project a success. With Cabinet Magic on the job, you can rest assured every aspect of your project will be handled to the very highest standard. This includes not only the typical contractor work of construction and installation, but also help finalizing your design and finding the right products and materials. Kitchen remodeling in Cerritos CA can range from simply updating the room with new cabinets, fixtures, and accessories to totally redesigning the floor plan. In either case, you may be concerned about how the finished project will turn out. Many people have found that a color that looked amazing in a sample size was too dark, too bold, or even too bland once their new flooring, cabinetry, or countertops were installed. At Cabinet Magic, we believe being able to accurately visualize your kitchen remodeling in Cerritos CA before work begins is key to being satisfied with the final result. That’s why we utilize 3D computer rendering to help clients design their new kitchens. We’re happy to create multiple versions of the design so you can easily compare different options. We never begin work without your sign off and approval of every detail of the design. Custom cabinets give you the ability to control not only the appearance your cabinets, but also their functionality. At Cabinet Magic, we have almost 30 years of experience in crafting custom cabinetry. We can custom fabricate any size cabinets with any combination of doors, drawers, roll outs, racks, and other storage accessories, and of course you will have your choice of styles and finishes. We are true perfectionists and we take great pride in delivering quality cabinetry that lasts. Are you ready to stop dreaming of kitchen remodeling in Cerritos CA and start actually making it happen? Call Cabinet Magic at 800-828-4380 now and request your free in home consultation. We’ll be happy to share ideas and provide a free estimate for the project.